Beautifully remodeled ''Sloop'' plan on the 7th floor of the most desirable Mainsail buildings. Enjoy spectacular gulf and beach views from this 2BR/2BA, 956SF designer furnished condominium. The condo's open space concept is exceptionally light and bright with a color scheme that matches soft white with pewter grays and stunning black. The horizontal glass backsplash perfectly complements stainless steel appliances, and an expansive breakfast bar offers grand counter space from the kitchen side. The dining and living spaces flow seamlessly with a full mirrored wall for an exceptionally Updates include the washer/dryer, dishwasher, microwave and A/C unit, and tile floors are both classic and convenient. The covered balcony opens via glass doors from the open living space and the master suite, and bathrooms are attractive with granite countertops. White panel doors, multiple ceiling fans for comfortable interior air flow and window treatments add to the sophisticated aura in this special two-bedroom, two-bath resort and rental ready condominium. 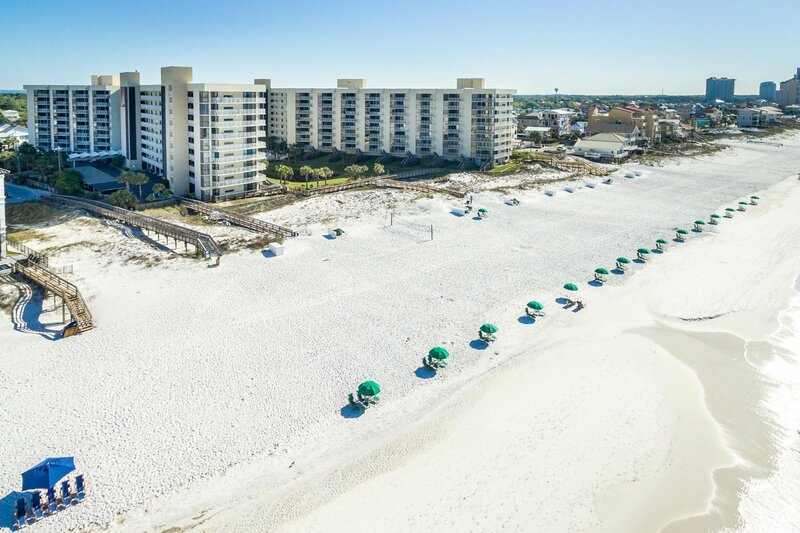 The gated community of Mainsail provides 24 hour security, 2 large pools, whirlpool, community game room, exercise room, shuffleboard, tennis, BBQ grills and 700FT of deeded beach!